Please accept my blessings. I beg to acknowledge receipt of your letters, one to the GBC and Prabhus and one to me, dated 30th December, 1970. I am so pleased that you are thinking of distributing my books to the largest extent. Distribution of books means propagation of our mission. If we can distribute KRSNA book in thousands upon thousands, automatically the Krsna Consciousness Movement will be spread up. You have rightly drawn the attention of the GBC on this point. Anyway, I have immediately sent one telegram to London reading as follows: "SHIP ONE THOUSAND KRSNA IMMEDIATELY SINGAPORE DOCUMENTS TO BALI-MARDANA--SYAMASUNDARA". So you also remind Mukunda and Murari for shipping the books as early as possible. Immediately I want $17,000 for printing Bhagavad-gita As It Is in new enlarged and revised edition, so try to help in this connection. Regarding two brahmacaris, surely I shall send you two from India. This morning I have come to Calcutta and the address is as follows: ISKCON Calcutta; 11B Jatindra Mohan Avenue; Calcutta-6. From Calcutta I shall be going to Allahabad by the end of the second week of January and the address there is as follows: c/o Prabhu Dutt Brahmachary; Sankirtan Bhavan; Jhusi, Allahabad; India. May Krsna bless you for your growing enterprise to broadcast this Movement. This kind of transcendental enthusiasm is the basic impetus for Krsna Consciousness. My Guru Maharaja used to say, "One who has got life--he can preach." Please accept my blessings. I beg to acknowledge receipt of your letter dated November 29th, 1970, along with enclosures of flyer and news clipping. I am so much glad to know that you are working on both you and your wife with great enthusiasm to preach the message of Lord Caitanya to the fallen souls of this age. My Guru Maharaja has declared that the real life of a man is preaching. If one has at all got any life in him then he will preach. So I am very, very pleased by your constant efforts to enliven the people in general even in far off lands by the simple methods of direct devotional service to the Lord by chanting His Holy Names. We have recently been preaching and holding Sankirtana in some small villages and the result is very good. The simple villagers are very much attracted by this Sankirtana process and they join with us very nicely and listen attentively. So I am glad that you are also preaching in the outlands. That is very nice. Lord Caitanya wanted that His Movement should be spread everywhere, to every village and city and now by your kind cooperation His Holy Desire is being fulfilled. Regarding your tendency to become angry in public, that is alright provided there is positive reaction. Otherwise we do not wish to create any unnecessary enemies and you should curb your anger by your advanced intelligence in Krishna Consciousness. We have to better correct the faulty habits of the conditioned souls by persuasive authoritative preaching and personal example without stop. The mantra to Ganapati is not bona fide. That is another nonsense. Your worship of Guru-Gauranga and Nrsimhadeva is very nice. Please make it as attractive and gorgeous as possible though simple. The leaves and flowers of Tulasi may be offered to the devotees of the Lord for offering to the Lotus Feet of the Lord Krsna, not even Srimati Radharani. It appears that Fiji is very nice place for Krsna consciousness from the appearance of such nice flowers and Tulasi for the worship of Krsna there. Please offer my blessings to your good wife. Hope this will meet you in good health. P.S. Sometime back I dispatched one tape to you by registered book post air. I do not know if you have received it or not. Please let me know. Please accept my blessings. I beg to thank you for your letter dated November 30th, 1970, and noted the contents. I am very glad that you have joined with His Holiness Visnujana Swami for increasing our great movement through the Southwestern states of your country. Your quotations from our Vaisnava sastras are very nice and I request you thoroughly to study all of our literatures very thoughtfully and try to understand the sublime import of this Krishna consciousness philosophy. 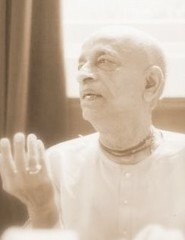 The basic principle of advancement in our Krishna consciousness is stressed by Caitanya Mahaprabhu that if one simply chants the Hare Krsna Mahamantra without offense and has firm faith in Krsna and Spiritual Master then he will advance and he only can understand the deep import of Krsna consciousness. So please do not ever become discouraged. That is one of the defects of conditioned life. Simply execute your duties in Krsna's service, chant sincerely, and follow the regulative principles faithfully. If you carry out this simple order of life, all your uncertainties will come to nothing by the grace of the Lord and the whole matter will become clear. The Lord is very kind and He awards right understanding of His transcendental Supreme Personality to His faithful devotee. And there is no such thing as material pangs for such a pure devotee of the Lord, because the Lord protects His devotees from the demoniac material allurements provided the devotee sincerely keeps himself pure by the above mentioned process of regulated life in Krishna consciousness. Therefore there should be no fear for you. Just know the danger lurking at every step in the material world and continue to execute your devotional service with great enthusiasm and determination. May Krsna bless you in His service. Hope this will meet you in good health. Please accept my greetings. Since I've come to Surat I've not heard from you. I hope everything is going well with you. Out of the many life members, Maharaja Bharatasingh gave one check numbered 0011644 from the State Bank of Indore and this is now returned with remark "refer to Drawer." This is the first time that we've got such experience. I am therefore handing over the check which is enclosed. Kindly see the Maharaja Bharatasingh and if he'll kindly pay us cash it will be very much appreciated. In realization of the cash, kindly deposit it in the Central Bank of India, Indore Cloth Market Branch, for mail transfer to the head office in favor of the International Society for Krishna Consciousness. Please let me know what action you have taken in this connection. You can write our Bombay address as given above. I am going to Bombay tomorrow. Re: My Savings Bank Account Number 4966 with you. 1. I departed from India on December 13rd, 1967. 2. My Reserve Bank Approval Number and date is No. 4599/2-67 dated November 18th, 1967. 3. The purpose and duration of my stay abroad are preaching work on the philosophy of Caitanya cult and the duration was two (2) years and nine (9) months. 4. I was being maintained by the International Society for Krishna Consciousness of which I am the Founder and Acarya. 5. The date of my return to India is August 24th, 1970. 6. I do not hold any foreign shares or securities. 7. My Passport Number is I-276896, issued by the Regional Passport Office, Delhi, on June 10th, 1965. I am enclosing herewith the Exchange Control Form A. 7 (C) duly signed by me in duplicate; please find. Please accept my blessings. I beg to acknowledge receipt of your letter dated 29th, December, 1970, and noted the contents. We shall fly by IA flight Number IC-175, departing Bombay on the Fifth January at 5:30 PM (17.30) reaching Calcutta by 7:45 PM (19.45). Please arrange for our reception. P.S. Regarding Hamilton house, if we are certain that the tenant will vacate just after one & half year, then we can purchase the house. If there is no such certainty then it will be risky job. Please accept my blessings. I beg to acknowledge receipt of your letter dated December 22nd, 1970, and I am sorry to learn that although you are so sober you have been disturbed by your married life. Married life does not mean that there will be no disagreement between husband and wife--that is a custom from time immemorial. According to Vedic system, disagreement or quarrel between husband and wife should never be taken very seriously. The Vedic system therefore gives a concession for the wife to separate from her husband for some time and go to her father's house. So Cintamani may come to me for some time, but you cannot deviate from your responsibility in Japan. If so desired, Karatieya Maharaja and Bruce can go immediately to help you, so arrange for their passage and I shall send them back. I think Bruce has got his return ticket. Do not be diminished in your enthusiasm. You should always think of yourself that you are sold to Krsna as slave and that is the only way to get relief of the slavery of Maya. I hope you will understand me rightly and do the needful. May Krsna help you always. P.S. At present I am in Surat on the 4th Jan. 71. I am going to Bombay, from there I shall go to Calcutta on the 5th evening by plane, on the 7th there is an important meeting in Calcutta. Our present Calcutta address is 11b Jatindra Mohan Avenue c/o Goendha, Calcutta. Please immediately let me know by wire to Calcutta address whether KRSNA Vol: II has been shipped already or not. I am very anxious about it. If you so desire the whole Sankirtana party in India may go to Japan as you say there is good prospect. and thus feeling enlivened. Just see that the standard of purity is strictly maintained and the standard of enthusiasm for spreading Lord Caitanya's Movement is increased. Please offer my blessing to all the nice devotees of Los Angeles Temple. P.S. I think with Sai's money in 10,000/$ denominations four bills you have to come to India. Syamasundara. will write to you. Please accept my blessings. I beg to acknowledge receipt of your letter dated December 18th, 1970, redirected to me here in Surat we have had a very successful preaching program during the last two weeks. Also in hand I have your letter dated 26th November, 1970, which is also acknowledged. The most important thing is that the money donated by Sai should be kept as I have directed you for some concrete project, specifically the construction of a large center here in India. So you please keep it intact and wait further instructions what to do with the $28,000. Otherwise, it is a bad policy to send good money after bad money as in the matter of paying some past debts. That is not good business proposal. I am sure those debts will be liquidated in due course by other means as I have suggested to you before and you have also indicated that in some time hence the BTG debt will be cleared. I am very glad that you find the situation in Hawaii so congenial and I know that Gaurasundara is doing his best there. The newly acquired property I have named as Advaita Bhavan and it sounds very inviting place for me to do my translating work. I am glad that Sai is also improving. He and his former followers are all good souls, so all of you should try to help them become fixed up in the bona fide line of devotional service to Krsna. I am also glad that you are continuing to send money into the ``Bhaktivedanta Book Fund Deposit'' with Dai Nippon. I am very eager to begin printing of new books and the first thing is clearing our bills to date. So the matter of proceeds from distribution of Books should be carefully done so that the returns may be immediately sent off to Dai Nippon. I have also written to Satsvarupa and Advaita that the plan for printing our Bhagavad-gita As It Is in enlarged edition should go on as soon as possible. Regarding your proposal that recommendations for initiations should be approved by the GBC members, that is not a good idea. Such recommendation is for the local President to make from first hand observation. I am glad that you have found all our West Coast Temples to be going on nicely to the standard and I am also very enthusiastic for you to continue opening more branches as far as possible. But the first thing is that the already established Temples must be maintained and the second is that once a center is opened it may not be closed down. That is very bad. So all considerations must be done very thoughtfully and carefully. Please continue to work with determination and great faith in Krsna and Guru and full cooperation of your God-brothers and fellow members of the Governing Body. If you all keep to the standard practices of pure spiritual life as I have humbly instructed you, there is no doubt that this Sankirtana Movement of Lord Caitanya will overtake all the earth and all opposing parties will be cracked down to nothing. Please offer my blessings to all the good devotees in Los Angeles. Hope this will meet you in good health.